Strong Bonds remains a mission-critical component of wellness for Soldiers and family members, and as such, our command, USAREC highly encourages Soldiers and family members to participate in the program. You may ask, “Why?” It’s because Strong Bonds is the chief of chaplain’s premier resiliency and relationship building program for single soldiers, married Army couples, and Army families. 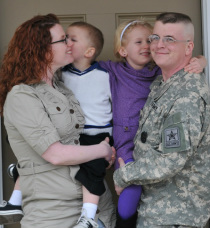 The goal of the program is to increase Soldier and family readiness through relationship education and skills-based training. Lodging, meals, transportation, instruction, and child-care are authorized during Strong Bonds events to support Soldiers and family members. Strong Bonds events are not Family Moral, Welfare and Recreation activities. However, Strong Bonds events often occur in metropolitan areas where Soldiers and family members may take advantage of activities offered in the city, while they are enjoying some free time after a full day of Strong Bonds training. The intent is to conduct Strong Bonds events in a relaxed, stress-free environment conducive for learning relationship skills and developing strategies to address the impact of repeated deployments, resiliency and conflict. (1) Strong Bonds Alpha events: Four hours of structured training conducted locally in a military or commercial facility. At a minimum, two hours will consist of approved Strong Bonds curriculum; additional time may be needed depending on curriculum training requirements. Units may also conduct up to two hours of discretionary relationship skills training based on unit needs assessment. (2) Strong Bonds Bravo events: Eight hours of training conducted locally in a military or commercial facility. At a minimum, four hours will consist of approved Strong Bonds curriculum; additional time may be needed depending on curriculum training requirements. Units may also conduct up to four hours of discretionary relationship skills training based on unit needs assessment. (3) Strong Bonds Charlie events: Twelve hours of training conducted overnight in a commercial offsite venue away from the installation, armory, or reserve center. At a minimum, six hours will consist of approved Strong Bonds curriculum; additional time may be needed depending on curriculum training requirements. Units may also conduct up to six hours of discretionary relationship skills training based on unit needs assessment. USAREC chaplains and chaplain assistants are certified to conduct Strong Bonds training to single Soldiers, married couples and families. (1) Strong Bonds for singles. This program component provides focuses on developing skills for building a great relationship, managing expectations, making healthy choices, coping, resiliency, and finding the right partner. (2) Strong Bonds for married couples. This component provides instruction on strengthening the marital bond, and giving couples the tools and information for developing good communication skills as a couple and relationship building. (3) Strong Bonds for families. This program provides instruction for developing effective communication and listening skills for both parents and children and building good parenting. Both the parents and the children are active participants in the instruction. All Strong Bonds events include a prescribed amount of classroom instruction from certified Strong Bonds trainers. Training may be conducted during duty hours, after duty hours and during weekends. The instruction is informal, helpful and transformative. It involves some group discussion and interactive instruction. Strong Bonds events often include some planned free time for individuals, couples and families to implement the lessons learned during the training sessions. Unit Ministry Teams sometimes offer other types of training, literature, resources, pastoral counseling and worship services during Strong Bonds events.